I love this picture! Becca still had a little bit of baby fat …love the double chin! And well, she loves her little sister. The bath chair, along with a new and long detachable shower head has made bathing Becca a lot easier. But she has gotten a lot longer and getting her out of the bath (though from a slightly higher position) is a little hard. It’s like picking up a really long, 38 lb, slippery noodle. -10 minute pep talk: Does she really need a bath? She doesn’t stink that bad…well, I guess she kind of does. Hmmmm, when was her last bath? Oh it’s been a week, it’s really time. Ok.
-Collect all possible needed items set up in the hallway for dressing (the bathroom is tiny and it’s hard to get her up and down in the bathroom so we dress her in the hall). Put bath chair in bathtub. -Make sure Becca’s fingernails are clipped before giving her a bath or else she scratches herself a ton (draws blood on occasion). -Undress Becca and plop her on the bath chair. Waiting to take her diaper off until she’s laying on the bath chair saves me from having to clean up a pee trail (learned the hard way :)). - Drape washcloth over g-tube so Becca can’t yank at it. -Working quickly as possible bath the cute Becca. -This is the tricky step. While holding edge of towel in mouth lean down in a sort of squat position, lift Becca and pull her on to lap while sitting down on the toilet. If it goes smoothly, Becca will then be sitting on the towel and can easily be wrapped up all cozy like. Becca is only five. I have a feeling that we’re going to look back when Becca is 10 or 20 (yikes!) and say, man, we had no idea how easy we had it. But that’s the beauty of taking things one day at a time. I know how to bathe Becca now and that’s all that matters. When the day comes that it gets a little too hard, we’ll figure something out. There are a few things that Brian and I have had to do for Becca that we never could have guessed we would ever have to do. One thing that I hoped I would never have to do is to send my young child in to a procedure where she would be put under. We have now done that five times and it has only gotten harder (especially since last summer). Going right along with last summer we never thought we would ever have to watch our child be on life support (hope that one never happens again). There are definitely more (suctioning, constipation remedies, placing feeding tube down her nose), but this post is about how I will have to be brave tonight. Ok, that sounds dramatic…but I actually am a pretty dramatic person so there you go. The time has come to replace Becca’s G-tube. Yikes! 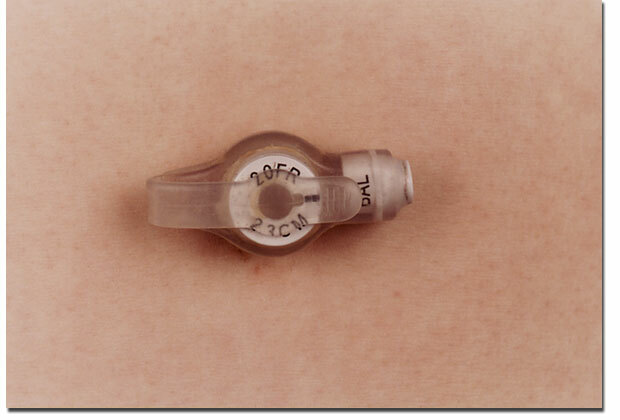 Her current button (her g-tube is called a Mic-key button) was placed by her GI doctor and as he placed it he said, now you will replace future buttons in your home. I’ll admit I thought, well gross. But, after placing a NG tube down Becca’s nose (Brian is the brave one who would do this for the most part but I had to try it so that I would know how to do it if she pulled it out when he was out of town), this should be a piece of cake. Last night I told Brian I wanted to be brave and replace it. I am a little nervous though. I hope it doesn’t hurt her and I hope it’s not too messy. And well, I guess the idea of having an open hole to her tummy for a brief moment grosses me out. Wish me luck! I think we’ll do it before dinner ;). That is it’s time to revive this blog. Last night my husband accused me of always sugar coating everything. I started to defend myself and attempted to prove him wrong only to realize that it’s true. I tend to preface or conclude difficult aspects to my life with super positive statements. For example, “Becca is having a hard time breathing at night. But she has been so healthy lately and I’m so grateful for her!” I guess I’m not good at telling things how they are without feeling like I’m complaining. I really truly do love my life and adore Becca and so I guess I figure that if I talk about hard things, I also have to prove that I really am happy. The beauty of this blog is I can just tell it how it is. This is meant to be a record of our life with Becca. I really need this right now. I have been struggling with the fact that I don’t really talk to other people about Becca. I don’t know how to without making other people feel awkward. It seems like people feel bad that they can’t really relate to that aspect of my life and it just gets awkward (and remember how I don’t know how to talk about life with Becca without coming across as complaining?) and I just don’t like making people sad. So here we are! I have a list of topics I want to write about that cover different aspects of Becca’s life and hope to post sort of regularly (whatever that is) about our life with Becca. I took this picture of Becca today. It is sure hard to take non blurry pictures with her constant shaking and busy hands. But she’s looking older huh?